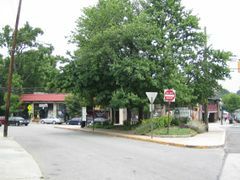 Virginia-Highland  is an area east of Piedmont Park in the center of town known for its pubs and restaurants. Pedestrian friendly and packed sidewalks until late at night. The name is derived from the intersection of Virginia Avenue and Highland Avenue. 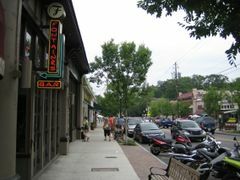 The neighborhood is adjacent to Poncey-Highland to the south, and Morningside to the north. Virginia-Highland can be reached by MARTA Bus #45 to/from Midtown Station (N4), and by MARTA Bus #6 to/from Inman Park/Reynoldstown Station (E3). Walk from Virginia-Highland to Little Five Points. Approximately a 2 mile walk. Walk south down Highland Avenue from Virgninia Avenue to North Avenue, turn left and walk one block to Moreland Avenue. Turn right on Moreland and walk through Little Five Points, and turn right on Euclid Avenue. Get a hair cut and a massage at Key Lime Pie Salon & Spa. Virginia Highlands has a mix of clothing and gift stores, many with Southern flair, mostly catering to the 20-30s-something woman. Bill Hallman  ($$$) 792 N Highland Ave NE. Hip clothing boutique. Gaslight Inn, . Nestled right in the heart of the charming Virginia Highlands neighborhood, this bed and breakfast is just a block away from restaurants, bars and boutiques. Poncey-Highland and Freedom Park are less than one mile south. Piedmont Park is just due west. This page was last edited on 2 April 2011, at 15:30.